Surprising as it may seem in our modern and hygienic age, the very notion of our own bathroom is a relatively new concept. Pampering one’s body was something that was traditionally practised in public places: from Roman bathhouses to Turkish hamams to British hose sheds. This all changed, thankfully, in the second half of the 20th century, when home-bathing became the norm, moving from the public to the private sphere: the bathroom was born. Nowadays, it’s not just another room in the house. It’s a cherished place and personal space that we simply cannot do without. Beyond the practical aspects—making ourselves spick and span—it’s a place of reflection, a mirror of life itself. 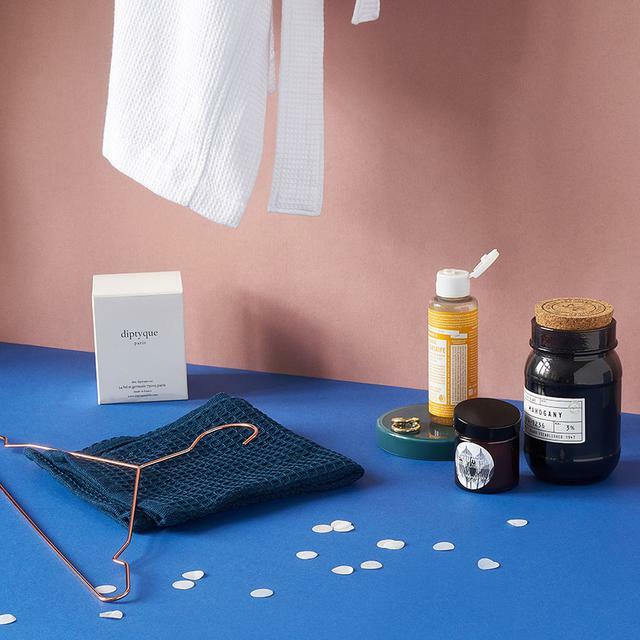 We asked four of our JUNIQE staff to share their bathroom rituals and picked out some arty accessories and wall décor to complement their precious me-time. Our social media manager Fernanda firmly believes in the proverb that the future belongs to those who get up early. This isn’t surprising given that she usually wakes up around 6:45 am—without hitting snooze—to squeeze in a good half-hour run in the park before most of Berlin has reared its sleepy head. With her sports gear prepared the night before, she starts her day by stretching and hydrating with some high-quality H20. Then she begins to run, catapulting her legs forward one at a time to the tonal rhythms of her Spotify playlist of the week. It’s a ritual that enables her to come to the office pumped with energy each and every day, to the slight jealousy of her colleagues. But her favourite part is the shower that follows. Fernanda swaps the headphones for some speakers and continues her morning soundtrack—mostly populated by 80s classics—under a delightful deluge of steamy water. So she doesn’t completely lose track of time, a little alarm clock lets her know how long remains of her invigorating morning routine. She finishes off by massaging in some of her favourite moisturiser before making a delicious, yet balanced breakfast: the perfect recipe for a productive day. After my shower, I prepare a sports breakfast of Greek yoghurt, bananas, strawberries, and linseed, topped off with a spoonful of peanut butter, and I'm ready to start the day! Our bathroom ideas for Fernanda? 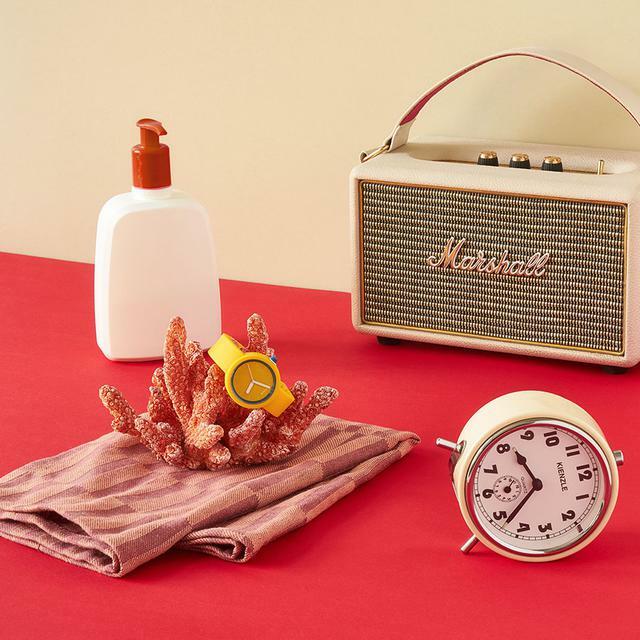 A shower curtain with a motivating mantra and a bath towel in bright, vitamin colours to give her even more energy in the morning—and stay in that 80s spirit spilling from the stereo. Staying creative all day long, in addition to managing a team and enduring endless meeting-a-thons, is often exhausting. Maia—commander in chief of team editorial—knows this well. She feels her best when she takes off her shoes after the day is done and gets ready for a hot, steamy bath. A few drops of essential oils in her diffuser or a homemade scented candle—lavender, rosemary, or eucalyptus, depending on the day—as well as bath salts, complete what promises to be a moment of absolute serenity. Inspired by her favourite spas, she plays in turn with Balinese and Turkish ambiences, reminiscing about her former lives in Istanbul and Southeast Asia while she soaks the day away. 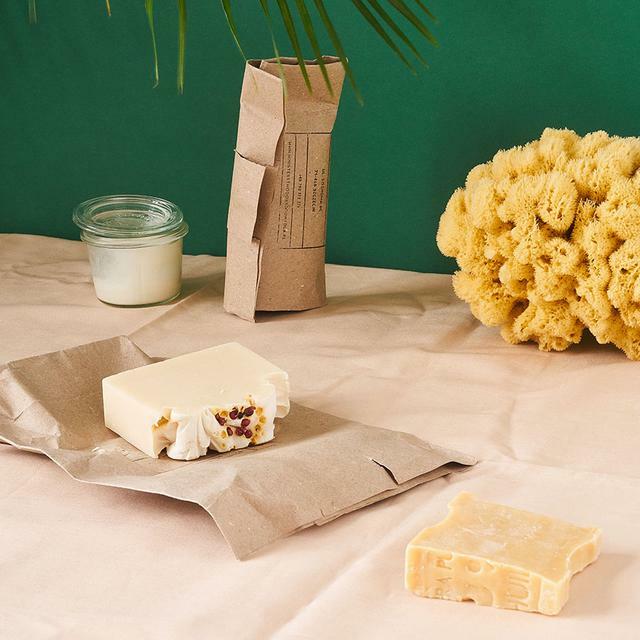 An avid follower of ecological philosophies, all the products she uses are 100% natural, something also reflected in her décor: pure wood and stone, sprinkled with shells and exotic plants. Taking care of yourself is a sensory experience above all else. At the end of a long and tedious day, there’s nothing more relaxing than running a hot bubble bath, lighting a few candles and simply enjoying the silence. A towel or two with botanical motifs would be perfect for Maia to wrap herself in and stay warm long after her bath, reminding her of nature’s tranquillity. 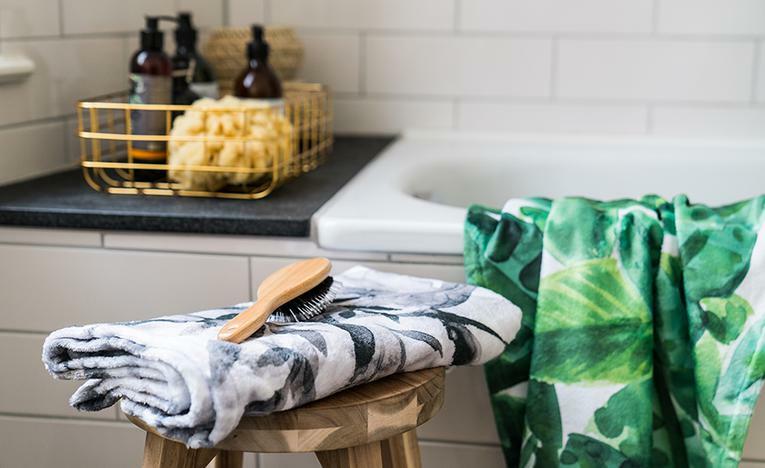 It’s also an excellent way to add a touch of green to her bathroom décor without tending to (yet more) plants, especially practical in darker climates—the perfect way to complement the urban jungle trend. Emilie is the source of much admiration in the office—she manages to juggle her day job as keyword fairy, her upcoming wedding, and a packed social calendar after dusk. Between dinners at friends’, housewarming parties, or her latest escapades into Berlin’s booming culinary scene, it can be difficult to find a moment for herself. That’s why Emilie enjoys the time just before she goes out, when she has time to splash some water on her face and perfume on her wrists in her zen bathroom. This is a moment paralleled in blissfulness by an exhausted return home after, where she is greeted by a steamy shower and a fragrant soap that blends rosemary, cedar, and mandarin, before wrapping herself in a dressing gown of unrivalled softness. It’s rituals like these that allow Emilie to slip between her work and social life with such ease and grace. It's important to me that my guests feel good in the bathroom when I'm hosting them for dinner or the weekend. I want them to feel at home. 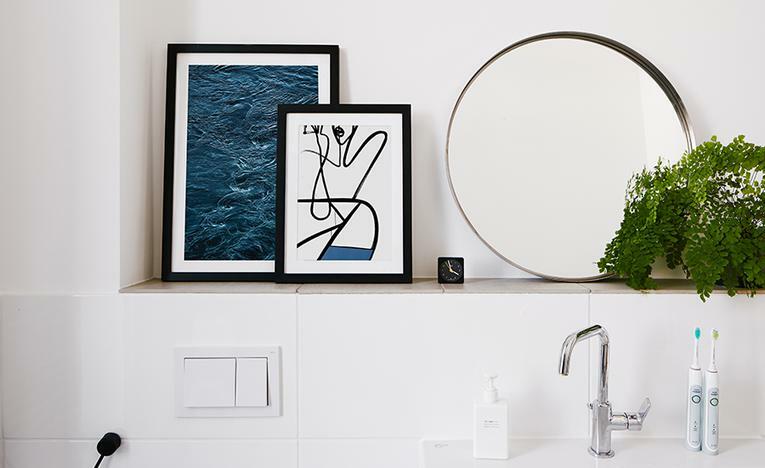 In a minimalist and sober bathroom like Emilie's, wall art can really let your personality shine. Clean lines, marbled patterns, and seaside photography will complete this already impeccable décor look—aesthetic touches your guests are sure to appreciate. Ina really loves what could be described as the “family side” of the job here at JUNIQE: training and developing our customer service heroes. She pampers her team as she does her son Ferdi. And one ritual she loves above all else is giving her son a bath. Ferdi is a real water baby, enjoying bath time just as much as Ina. After work, she gets those taps running so that the tub is ready at 6:30 pm. This gives them both time to have a splash around before dinner, going on wild adventures and fantastical voyages with their bath toys in tow, embarking a pirate ship one day, boarding a submarine the next. Then comes the moment when, Ferdi having drifted off into slumberland with his head full of dreams, Ina also gets to enjoy her much-deserved shower time. 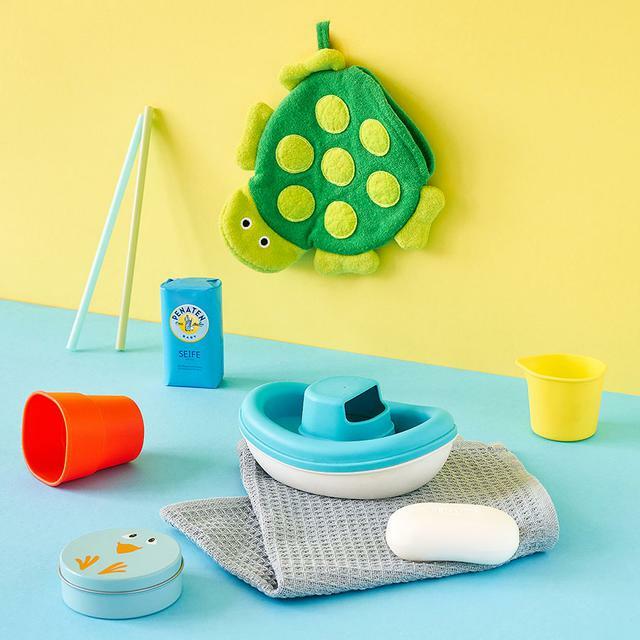 After clearing away the aftermath of their water-filled odyssey—the toys scattered all across the floor—Ina can enjoy her time in a clean, peaceful setting, while thinking back to the adventures they had. The latest thing he does? Wearing swimming goggles...but around his chest instead of his eyes! Sometimes there are tears when he has to leave the tub. But fortunately, he’s also very happy to snuggle up in his towel, so this moment passes pretty quickly. 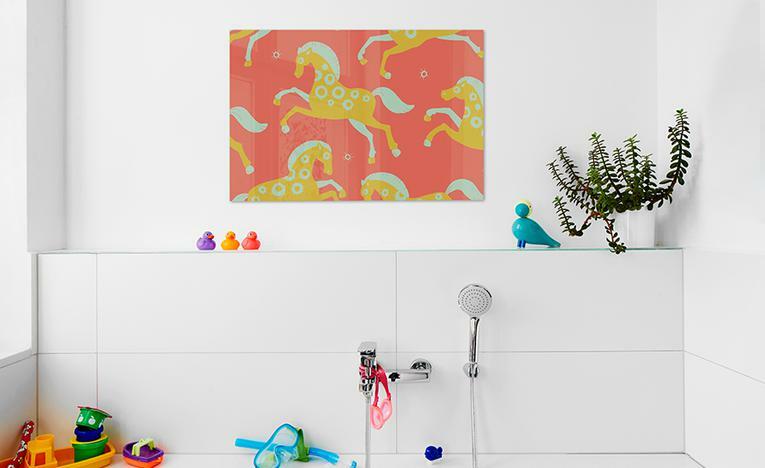 Acrylic glass and shower curtains are the perfect canvas for cute animals, playful designs, or even educational alphabet designs—everything goes! 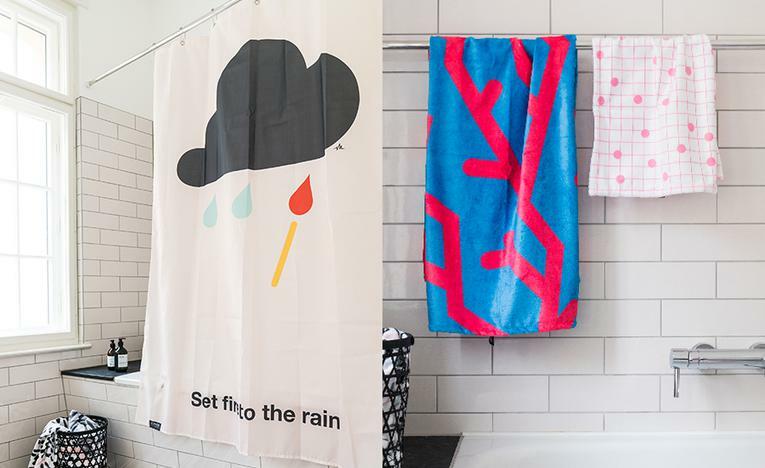 The secret to this bathroom trend is to choose a design that appeals to both parents and kids. Need a tip? Introducing: Amy Hamilton.